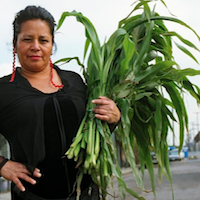 This politically charged, Oscar-nominated documentary tells the story of the fourteen-acre community garden at 41st and Alameda in South Central Los Angeles which at one time was the largest urban garden in the United States. Started as a form of healing after the devastating L.A. riots in 1992, the South Central Farmers created a miracle in one of the country’s most blighted neighborhoods. Growing their own food. Feeding their families. Creating a community. The film follows the South Central Farmers as they struggled to protect their urban farm from predatory real estate developers who used the Los Angeles political machinery to their advantage in order to throw the farmers off the land. The film serves as a metaphor of the environmental struggle we all face today. Links: Film web site | Netflix movie page (available via Streaming or DVD). 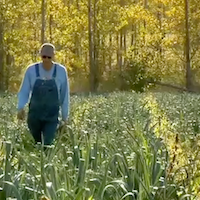 This documentary examines the shortcomings of America’s industrialized food system in comparison to the rising local-growth movement, whose proponents are shrinking the gap between farmland and dinner table.The quality, taste and nutritional value of the food we eat has dropped sharply over the last fifty years. Shipped from ever-greater distances, we have literally lost sight of where our food comes from and in the process we’ve lost a vital connection to our local community and to our health. This film will take you on a journey revealing the people behind the movement with chefs Alice Waters and Greg Higgins as guides. You’ll be introduced to growers, restaurateurs and consumers around the country who discuss their methods for bringing food production back home. Links: Film web site | Netflix movie page (available via Streaming or DVD).